Hearing for the European Commission Presidency: Towards a EU Strategy on Demographic Change – "The Europe we want is for all ages"
Demographic and climate changes are both major challenges facing Europe. They are also the two main areas where huge opportunities for economic growth, innovation and social justice can be developed in the coming decade. As President of the new College of Commissioners, you will have the power to reinforce the implementation of the Europe 2020 Strategy to ensure fair and sustainable growth and prosperity of European citizens at every stage of life. In this framework, a new EU Strategy on Demographic Change can become a main vector for economic growth and help EU Member States and regions adapt to the needs of their rapidly ageing populations in ways that are sustainable and fair to all generations. 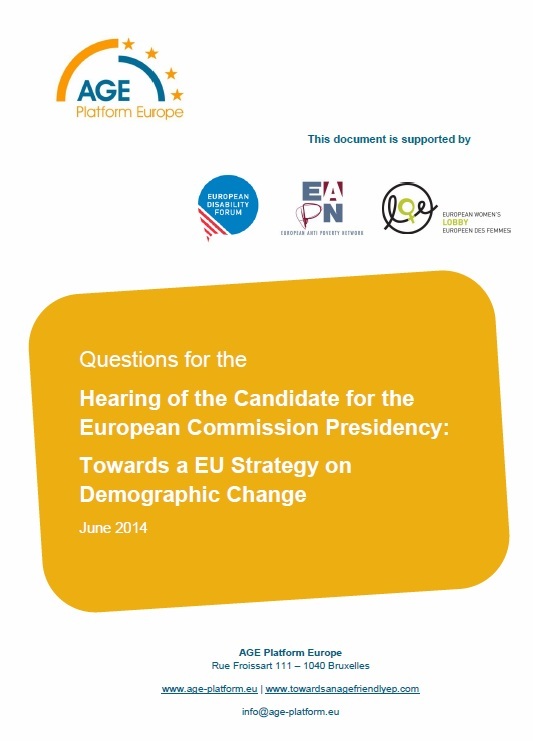 An EU Strategy on Demographic Change should seek to help coordinate and build synergies between EU major dossiers on which demographic change has an impact. Do you agree that the EU needs to adopt and implement a Strategy on Demographic Change to coordinate and build synergies between all relevant EU policy processes and initiatives to ensure that Europe 2020 delivers an EU for all ages? Specific questions have been drafted for each of the above areas. You will find our proposals for questions here. They received support from the European Disability Forum, the European Network Against Poverty, the European Women’s Lobby and the European Public Health Alliance.